Dr. Seuss: beloved children's book writer, social commentator, and political cartoonist. 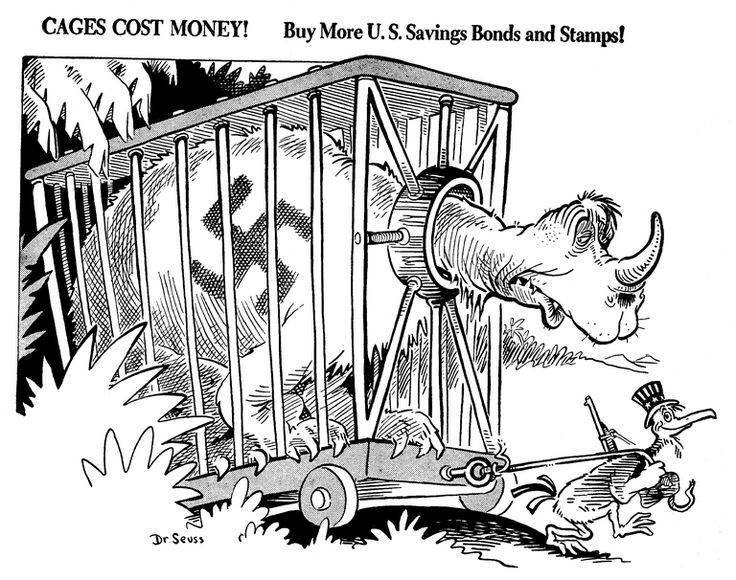 Not many people know that Theodore Geisel (AKA Dr. Seuss) turned his drawing talents to political cartoons during World War II. He was a white Christian who was pro-integration, anti-isolationist, and critical of anti-Semitism at a time when most of the country was the opposite. Dr. Seuss's children's books often show his moral beliefs; his political cartoons were no different, and they offer an insight into the complicated, interesting mind. Following his anti-isolationism, Seuss was a big critic of the leader of the isolationist movement America First — Charles Lindbergh. If you're thinking of the trans-atlantic flight Lindbergh, you've got the right one. 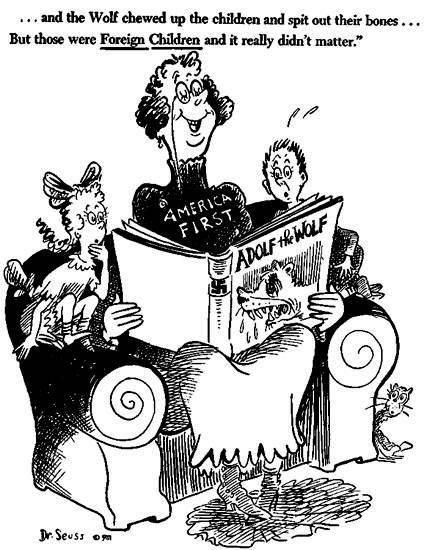 Seuss often portrayed Lindbergh as being in league with the Axis powers, or at least furthering their ideas and agendas. Pierre Laval was the leader of Vichy France -- France under Nazi rule. 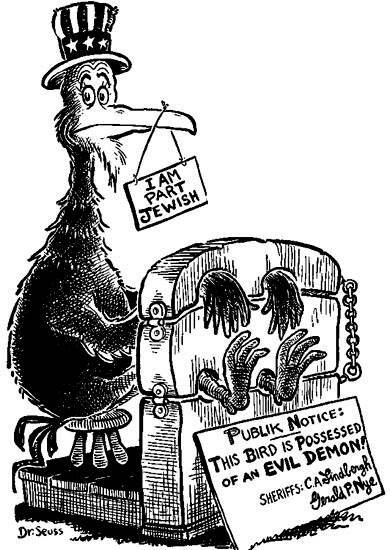 Dr. Seuss drew this cartoon right around the time the Holocaust reached France. 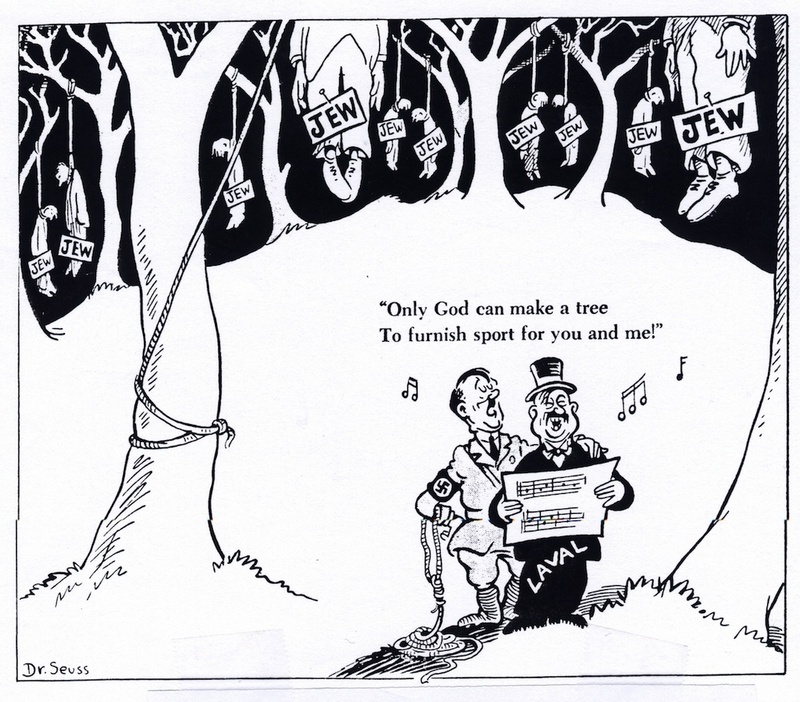 Seuss's support of Jews at home and abroad was as incredibly unpopular opinion during his time. In 1939, on the eve of WWII, Gallup Poll respondents indicated they were less likely to accept European immigrants if they were Jewish (although they didn't want refugees at all.) Many people know the story of the ship MS St. Louis, which came to Cuba carrying almost a thousand Jewish German refugees and was refused entry into the United States. Here Seuss blames some of his usual targets; Charles Lindbergh and Gerald Nye, an isolationist senator. During WWII President Roosevelt signed an executive order forcing the integration of defense industries, partly in an effort to avoid strikes during wartime. This was not a move largely supported be a pre-civil rights movement America. 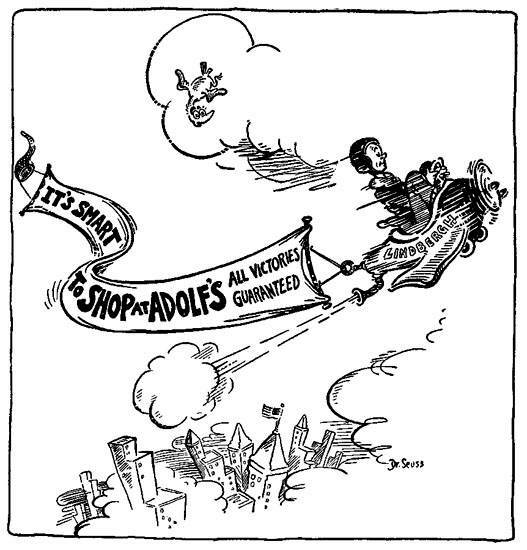 Dr. Seuss's advocation of integration was a rare voice during the 40s. I guess this is fairly self-explanatory. And once again, not entirely irrelevant in today's world. Along with his more moralistic cartoons, Seuss was no stranger to propaganda. He drew several cartoons advocating buying war bonds and, ironically, advising Americans to beware foreign propaganda. 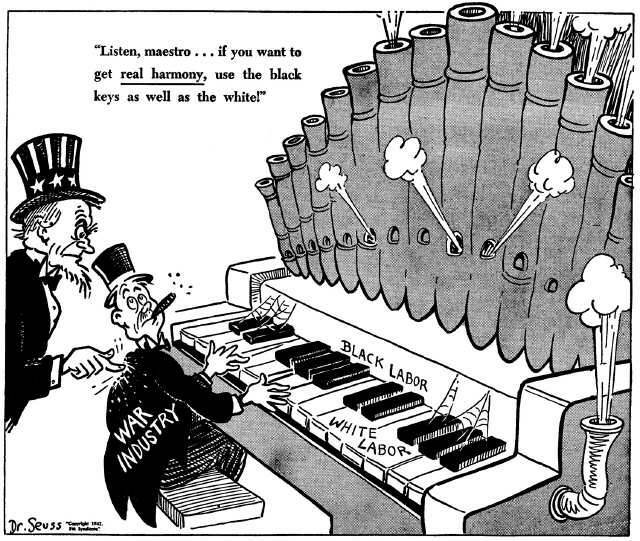 As progressive as Seuss was in other arenas, his treatment of the Japanese in his cartoons fell back on racist stereotypes and baseless fear-mongering. As above, he typically depicted the Japanese as universally evil and stupid, and was clearly pro-internment. The United States imprisoned as many as 120,000 Japanese-Americans on the West Coast during WWII, putting them into temporary internment camps. This was done regardless of citizenship status or actual suspect behavior, and most never regained the confiscated possessions and property they owned before the war. They were eventually given some monetary compensation and the US government issued an official apology, but every time the case has gone to the Supreme Court the government's actions have been upheld. Despite this negative view of the Japanese before and during the war, Dr. Seuss did eventually change his mind and rise above his racist beliefs. He visited Hiroshima after the US dropped the atomic bomb there, and was moved enough to write "Horton Hears a Who" as a sort of apology. And if "a person's a person no matter how small" can be interpreted as slightly condescending, we'll just have to take what we can get.